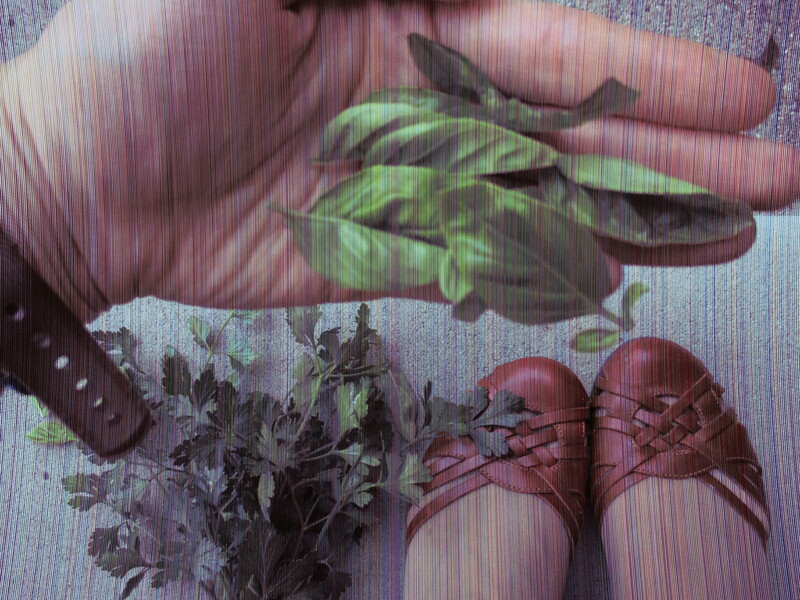 Leaves of basil, stalks of parsley, and my cute, cute red shoes. (They’re not as comfortable as they are cute, though). My garden had a weird summer. I feel like this is code for: I had a weird summer. So, that’s where this post is going. Now you have been notified. So: back to my garden. I feel like a lot of elements were working against my garden. For one, many of my perennials never even made it to the sky-side of the earthen-crust; where I usually am pulling sproutlings for weeks: nada. My mom said she had a similar problem–many of her perennials didn’t come back after the winter, either. Being resourceful, I transplanted some of the other plants and flowers into those gaps left by never-sprouted flowers. No luck there, either. An animal(? ), the elements(? ), whatever…somehow, those new transplants were nipped in the bud, too. Also, my guinea pigs trampled some plants. Also, my siblings, trying to catch the guinea pigs, trampled some of the others. And so, we have it: my garden. My trampled, mangled garden. And, sure enough, most of the time it turns out that I have done things incorrectly…only, I didn’t know I was making mistakes as I was making them, you know? Also, for what it’s worth, it’s been months and months since I’ve heard from God. You can read into that all you want, I guess. I used to hear from Him regularly and lovingly but, for a long time now…nothing. And, yeah, that’s true. To a point. Only, I still try to pray and I still go to church and I still read the Bible and and and and and…it doesn’t matter. Silence from da heavens. Luckily, someone gave me a crash course in some St. Ignatius a year and a half ago, and part of what I was taught is that: yo, sometimes it’s not your fault and God is just distant. Maybe he’s teaching you things, maybe you’re growing, but: it’s just important to stay calm and stay the course. So, I’ve been trying. You know what’s hard? Trying to figure out if things are OK when God isn’t there to affirm it. Well, for me at least. For me it’s real hard. Earlier this week, though, I tuned into this podcast (LISTEN. TO. THESE. BLOODY. PODCASTS.) and the guys were talking about being confident that God has placed you where you are, being confident that you’re not just aiming for a final destination but also that the journey is valuable and good. They talked about being intentional in all of the instances in which you find yourself. Yesterday I went into my garden. The basil is flowering and becoming too-woody to use. But, there are still a few leaves left that are good. I picked those leaves. I had planted a small parsley plant near some daisies. The daisies are long dead, but the parsley remains. I picked some parsley, too, even though the recipe didn’t call for it, because Tim once made me a salad with parsley in it, so now I know it is good. And I made myself a salad out of chickpeas, like I’ve learned from visiting the South, and I ate the perfect produce of my mangled garden. And I realized: I could still enjoy it. I could still enjoy the herbs and the few flowers and the golden sun that is late-summer. And so I did. Maybe right now my life is like my garden–a little bit unkempt, even though I’ve been trying, I promise I have. But that doesn’t mean that it’s without goodness or meaning or helpfulness. And I ate the chickpea salad leftovers for lunch, after I went to church.